The South Eastern Railway opened a locomotive shed at Hastings on the 13th February 1851. D. Sargent c1936 - c1955, J. Wallis, K. Auger 1985 - 1998, S. Jenner c2010 - ? Bert Tondo started as a cleaner on L.M.S. at Nine Elms. After three years he transferred to Tonbridge where he progressed to passed fireman. In 1962 he moved to St Leonard’s West Marina and, when that closed, he went to Hastings. Bert drove steam, diesel, and electric locos, and multiple units; he was a minder driver as well and ran improvement classes in his own time. He was a strong A.S.L.E.F. supporter and active branch member up until 1994 when he retired at 64. Bert enjoyed 22 years retirement but sadly passed away on 10 January. Last month was the first time Simon Jenner from Hastings had been to an Annual Assembly of Delegates and he was, he says, ‘encouraged and impressed’. ‘It’s amazing to be here from a small branch on the south coast and finding yourself helping to make decisions and form policies that will apply across the country. It’s interesting to hear how the points are argued and advanced, and refreshing to see how, at the end, everyone accepts the outcome of debates. ‘The highlight for me was listening to Samuel Wuma: having a visit from the leader of the Ugandan railway workers brings home that driving trains makes you part of a living international brotherhood. ‘In fact, I thought all the guest speakers were appropriate and interesting. The woman from the TUC was a pleasure and while Lord Adonis didn’t specialise in direct answers, it did reveal his political insights for the medium and long term. And it’s always a pleasure to hear Ken Livingstone. ‘My only disappointment was that the back of the hall wasn’t filled with local members. I’m sure they’d have enjoyed a very invigorating forum that was basically about them. ‘But perhaps that shows why I thought the best decision of the week was to review the union’s structure. We’ve sorted out finance and now we need to check everything else is in working order. We need to involve all our members. That’s certainly what I’d like to happen in Hastings. ‘It’s been a very positive week. There’s great value in the conversations outside the hall as well. It’s good to speak to drivers from all over the country, listening to their problems and seeing slightly different solutions. Just a couple of small picky points after reading the December Journal. The Tube and the Underground are two different beasts. The line running from Paddington to Farringdon is part of the Underground. it uses sub-surface stock, not Tube stock. The A60 trains are not Tube trains, they would not fit in a Tube tunnel, and the new S class trains are not going to be used on the Tube as they too are far too large for a Tube tunnel. The first Tube line was the city and South london Railway, now a part of the Northern line. The Tube lines in london are the Northern, the Piccadilly, the central, the bakerloo, the Jubilee, the victoria and the Waterloo & city. The district, the hammersmith & city, the circle and the metropolitan lines are all sub-surface lines, not Tube. The whole lot is designated The Underground. I was a first time delegate at AAD in Southend and was really impressed with the speakers, especially Tony West and Keith Ewing. I would like to say thank you to Marz Colombini and the District 1 delegates for the way we all worked as a team. And a big thank you to all the other delegates for making it a very enjoyable four days. It was the first time I’d got to see Tosh McDonald and all I can say is he was awesome! Plus there where powerful speeches from the General Secretary and National Organiser. I would like to comment on Gavin Turner’s letter (Journal, April). We should all remember that, whilst we pride ourselves on being a democratic union, we do vote people into positions of office as we trust they are going to fulfil that role for the better of all. I am not happy about the proposed pension changes but I believe that all the people concerned have done their very best to get us the best possible deal they can. Remember these changes have been brought about by this Tory government, not A.S.L.E.F. Personally, I wonder what my pension would be on retirement if it were not for A.S.L.E.F. in terms of not just the pension, but the pay awards the union has managed to get me over the 17 years I have been driving. Hastings welcomed E.C. 1 Marz Colombini to our beer & badges night where he handed out long- service awards to Bros. A. Bales, R. Evans (5 years); E. Holland, S. James (10); K. Brooker, C. Pulsford (15); and D. Hazleton (25). 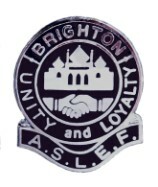 After around 53 years of being a member of A.S.L.E.F., I was surprised to learn that I had to write to head office to obtain my 50 year badge. This I received at my front door from a local A.S.L.E.F. member. If I had not applied for my badge, I wonder if I would have ever received it? I wonder how many other members may have missed out on receiving theirs. Surely this should be done automatically, from head office, and not have to be applied for.